Do you happen to run a roofing business within the province of Ontario? There is no doubt that you’re required to juggle numerous responsibilities each and every day. It is in your best interest to ensure that your clients are always completely satisfied with your company’s performance. Unfortunately, some customers are far more difficult to satisfy than others. In fact, it is nearly impossible to satisfy some clients. No matter how hard you try, some people will still find a reason to complain. You need to protect yourself from these types of individuals. With roofing contractors insurance, you will be able to protect your company from unsatisfied customers and mistakes made by your employees. There is often a misconception that some roofing contractors need insurance more than others. The truth of the matter is that all companies in the Ontario area should have insurance and a good amount of coverage. It doesn’t matter whether you work with traditional asphalt shingles, wood shingles or hot tar. There will always be a chance that something is going to go wrong. Shingles can easily fly from the roof, due to a little gust of wind. Even if the installation was perfect, there will be a chance that any damage caused by the flying shingle will be blamed on your company. No matter how you decide to run your roofing business, you need to make sure that understand what is covered under a contractor CGL policy. Your family, your workers and your company should protected to the fullest for all risk exposures! 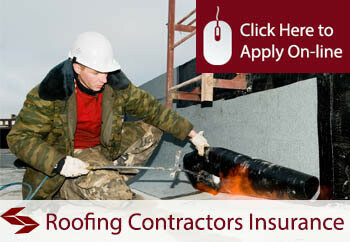 Do not skimp on contractors insurance for roofing installers. Get a good amount of coverage to ensure that you’re protected from all potential problems. Once you’ve decided that it is time to quit taking risks, you’ll want to go ahead and sign up for an insurance policy. There are numerous ways to make this happen, but some are easier than others. First and foremost, you may want to seek out a broker or insurance company online. There is a good chance that you’ll be able to request a quote on the company’s website. Compare quotes, until you find the right price for your budget. Then, complete the application process and sign up. Unfortunately, a lot of roofing contractors are not completely familiar with general liability insurance. Don’t worry. Brokers will be able to help. There are tons of brokers in areas like Hamilton & Ottawa Ontario and they’ll be able to answer each and every one of your questions. Just make sure you choose a broker that puts your best interest first! There is no doubt that roofing contractors and their employees are at a high risk of falling, as they work on top of some of the tallest roofs. Roofers work in some very difficult weather conditions, as well. When you consider these two risks, there is very little room for error. No matter how much you try to avoid an accident, your efforts will be futile. This is why it is crucial to carry general liability insurance, which will protect third parties and your company from potential financial loss related to these mishaps. Also, it does not hurt to have a good insurance history as showing a good track record to insurance company can land you a contract as an approved contractor for work. So if the customers of an insurance company file claims, the insurance company will contact you to get the job done. Most companies work diligently to protect and prepare their employees for the inevitable, accidents. You can enforce the strictest safety standards, provide refresher safety courses and safety equipment, an accident will still be a possibility. One minor accident can end up costing contractors thousands of dollars to rectify. With this said, you must decide if the risks are worth taking with or without roofing general insurance coverage. Are you willing to take the risk of losing a lot of money and potentially your business? If so, then do not acquire general liability insurance. If not, visit our Ontario office, where you can speak with one of our highly qualified, friendly and helpful brokers. Getting roofing contractors insurance can be a little tricky. You need to make sure that you choose the most suitable limit possible or you might regret it in the future. Our team is here to help you. We have brokers throughout the province of Ontario and we’re happy to help roofing contractors get commercial general liability along with Commercial Automobile coverage. We’ll do everything possible and take whatever steps necessary to ensure that your company gets the lowest premiums possible, as well as the most comprehensive coverage.